I was talking to a friend recently who said the 1969 picture book “Hand, Hand, Fingers, Thumb” by Al Perkins was a favorite of her grandson when he was a young boy. He wanted to hear the book read aloud repeatedly and chose that book to buy as a gift for every friend’s birthday. Her grandson, now an adult, loves that book even to this day and will no doubt read it to his own children when he has a family. What makes a picture book a classic? 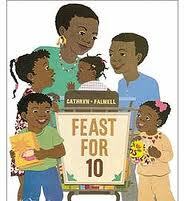 How does a book become timeless and relevant to children over many generations? There are a few qualities that classics share. At the core, the story has some ideas or actions by characters that are already part of a child’s life, and so are easily understood by a child. There are also some elements that are new, exciting, funny, curious, or sometimes even a little dangerous. That bit of the unknown makes the story memorable. The familiar plus the new equals a classic story, especially if the theme is about a childhood issue such as conquering a fear, keeping hope, being accepted, knowing you are loved, or just having unrestricted fun! A classic story, even if published decades before, inspires a child to think bigger and imagine more. 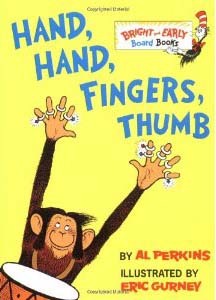 “Hand, Hand, Fingers, Thumb” by Al Perkins, illustrated by Eric Gurney. The characters of this book are all monkeys that act like children. They shake hands, sneeze, say hello and goodbye, and do everyday things (the familiar), all while they are drumming on drums (the unusual). 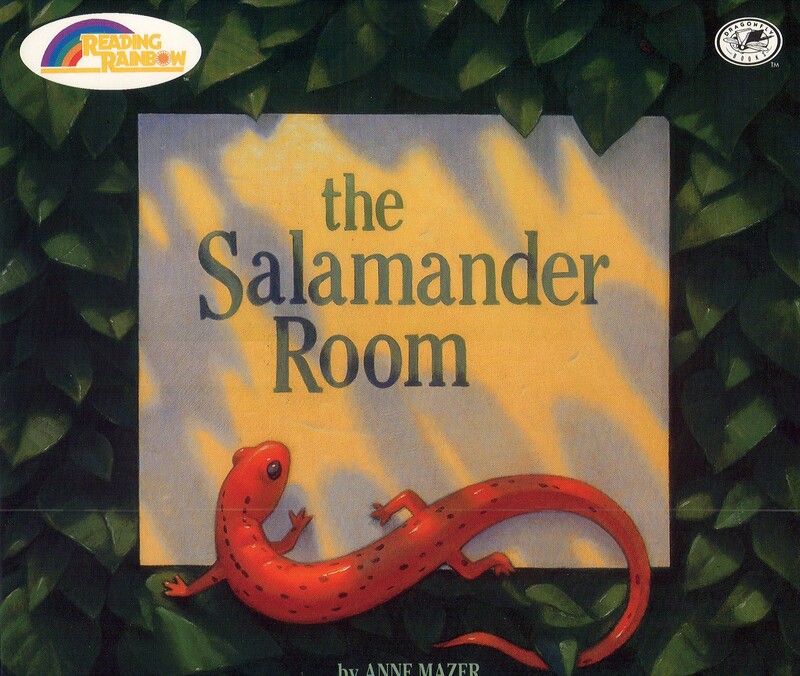 The story is very simple with lots of rhythm, rhyme, and repetition, so it is predictable and enjoyable to hear read aloud. These monkeys are all friends who have fun together–a reassuring theme for any child. “Goodnight Moon” by Margaret Wise Brown, illustrated by Clement Hurd. A young bunny goes through his bedtime ritual of saying goodnight to all the things in his room, including the paintings on the wall and even the air in the room. The story takes a familiar part of a child’s life and expands it to be magical. “The Story of Ferdinand” by Munro Leaf, illustrated by Robert Lawson. Ferdinand the bull is expected to be fierce and wild, but turns out to be peaceful and gentle. Every child can relate to wanting to be accepted for being himself and not what other’s think he should be. “Curious George” by H. A. Rey. This is another monkey story about a curious little guy who unwittingly breaks all the rules, but is forgiven every time. Does that sound like any child you know? “Corduroy” by Don Freeman. Similar to Curious George, Corduroy has an innocent, child-like curiosity that puts him into some predicaments that are a little scary for a small teddy bear. In the end he is always accepted and loved for who he is. The American Academy of Pediatrics (AAP) announced recently that it is asking its 62,000 members across the country to be advocates for reading aloud to children. Along with the usual attention to healthy physical child development, the AAP is now recommending, for the first time, that pediatricians inform parents about early literacy education. Families will hear from their doctors that the words children learn early on are critical for later success in talking, communicating, and eventually independent reading. In the first 3 years of a child’s life his or her brain is growing faster than it ever will again and children thrive on hearing words as others talk, sing, and read aloud. Studies have shown that there is a “word gap” that is evident as early as 18 months between babies who hear an abundance of words in everyday life and those who don’t. Thankfully, every family in our own community has been given this message from their child’s doctor since 2002, when Family Reading Partnership’s “Books to Grow On” program was launched. Children have been receiving a brand new book at 6 different child-well visits before the age of 4 and have come to expect that a visit to the doctor means a book to take home. The books gain value as they come as gifts from trusted medical professionals. 2 months: “Baby Cakes” by Karma Wilson, illustrated by Sam Williams. Rhyming words give parents love language to talk to their baby. 4 months: “Moo, Baa, La, La, La!” by Sandra Boynton. These silly animals noises are just the kind of sounds a baby is beginning to say as he practices vocalizing. 6 months: “Clap Hands” by Helen Oxenbury. A short story with pictures showing babies doing baby things like clapping, eating, and waving. 18 months: “I Can Do It Too!” by Karen Baicker, illustrated by Ken Wilson-Max. As a toddler becomes more independent, she can help out the grown-ups with every day fun. 2 years: “Roadwork” by Sally Sutton, illustrated by Brian Lovelock. All kinds of vehicles and what they do to make a new road. 3 years: “And Here’s to You!” by David Elliot, illustrated by Randy Cecil. Colorful, whimsical pictures of people, plants, and animals around the world with words of gratitude for all of life. 4 years: “My Village: rhymes from around the world” collected by Danielle Wright, illustrated by Mique Moriuchi. Poems written in English and the native languages of many peoples in many countries show how children are fun-loving no matter where they are from. When pediatricians give a prescription to parents to read to their young child, doctors are looking at the wellness of the whole child, not just their physical well being. Giving young children lots of words and loving attention gives them the emotional and cognitive foundation to have the best start in life!